I missed the last few weeks of Three Clover Thursday, but I'm happy to be back joining the Challenge Team for this weeks challenge, Baby It's Cold Outside. I used Blue Frost Ink and the Spectrum Roll Technique (past TJNL Tech) to create the background on Shimmery White card stock. 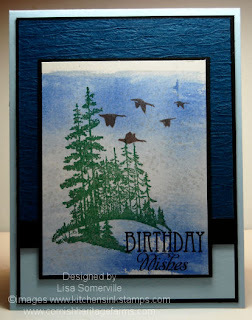 The Pines from Cornish Heritage Farms October SOTM are stamping in Adirondack Bottle Ink. I added the Geese from Kitchen Sink Stamps Friends of the Moon set in Memento Rich Cocoa, then used the small dots from this same set stamping them in Brillance Silver as my snow. The sentiment from Kitchen Sink Stamps Simple Sentiments was stamped in Black using a SAMJ. Thanks for stopping by. For more inspiration on this weeks challenge, click on the Three Clovers Logo on my sidebar. Awesome card. Love the wintery scene you created. Gorgeous card, it makes it so wintery being on that shimmery paper.